The Browning Auto-5 is a manual folding knife and part of the 2018 limited production collector's series. Along with being a collectible it also makes for a great everyday carry. 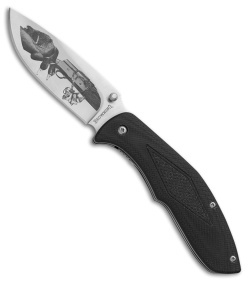 8Cr13MoV stainless steel, drop point blade has satin finish with a duck hunting blade etch, and a thumb stud opener. Black FRN handle with liner lock mechanism. Includes stainless steel pocket clip.